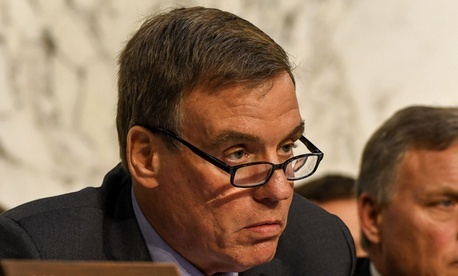 Sen. Mark R. Warner, D-Va., took to the Senate floor Wednesday to give an impassioned speech defending federal workers and express “great gratitude” for their service to the nation, especially in the face of hostile attacks from the Trump administration. He also cited the administration’s efforts to freeze employees’ pay, cut retirement benefits for 2.6 million retirees and survivors, and curb the influence of federal unions. Warner, who serves as vice chairman of the Senate Select Committee on Intelligence, said he was especially worried about Trump’s “all out attack” on the men and women in the FBI, the Justice Department and the intelligence community. "Unfortunately, in the months since Russia attacked the very institutions of our democracy, we’ve seen the most bizarre reaction from the President and his allies. Instead of uniting our country behind the cause of defending democracy and bringing our adversaries to justice, the President has led an all-out attack on the credibility of the FBI, the Justice Department, and our Intelligence Community." The actions have demeaned career FBI officials who had performed great service to the nation and impugned the motives of Special Counsel Robert Mueller, “perhaps the most respected federal lawman of his generation,” Warner said. “Worst of all, we saw the President of the United States stand onstage with Vladimir Putin last week and publically side with Putin over the career men and women of our intelligence community—many of whom risk their lives on a daily basis in order to keep our country safe,” he said. “My advice for this President, if he’s really serious about ‘draining the swap,’ is to leave our federal employees alone,” he said. Ross Gianfortune contributed to this report.